viaLibri ~ Perspective Pictorum atque Architectorum, I. Pars, Qua facillima ac expeditissima Methodus omne id quod ad Architecturam attinet, optica ratione delineandi exhibetur... II Pars, Qua porro expeditissima Methodus omnia..
Perspective Pictorum atque Architectorum, I. Pars, Qua facillima ac expeditissima Methodus omne id quod ad Architecturam attinet, optica ratione delineandi exhibetur... II Pars, Qua porro expeditissima Methodus omnia..
Augsburg: Jeremias Wolff, 1719. hardcover. very good. 2 volumes in 1. 220 copper engravings by Joanne Boxbarth (Georg Conrad Bodeneer). Title and text in German and Latin in two columns. Some creasing on title page and last few pages of the index. 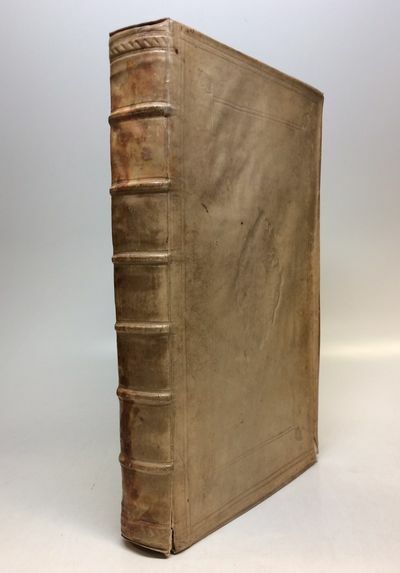 Thick folio, original vellum (a bit warped). Augsburg: Jeremias Wolff, 1719. Internally a very good copy. First published in 1706-1709, Pozzo's treatise on perspective was written for painters and architects. His greatest masterpiece being the ceiling of the Church of Saint Ignazio in Rome. Berlin catalogue 4726; Brunet IV: 984. With the small ownership signature of art historian Meyer Schapiro.